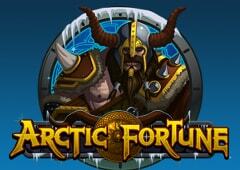 Voluptuous Vikings, wild wolves and frozen fighters all decorate the reels of Arctic Fortune, a pokie from Microgaming that despite its' ice-cold appearance has welcomed a host of players from around the world thanks to some decent bonus rounds and an unusual format. While a free spins game that features a nice multiplier and bonus coins may be an attraction, many players also like the 1024 ‘Ways To Win’ system that does away with the normal paylines and instead awards a prize anytime identical symbols line up on adjacent reels, starting from the left hand one. The effect of this is for there to be lots of winning spins, but reduced prize levels with each and a maximum jackpot that is slightly limited, at 6000 coins. 5 reels and 4 rows of symbols are enough to give the 1024 different winning combinations, with all positions filled with images related to the theme, so there’s none of the high card icons that so many games use to fill up space. A couple of Viking warriors, and a beautiful female warrior, (warrioress?) are the highest paying symbols, and are joined by longships, a white wolf, horn and treasure chest, all of which are surrounded by frosty looking edges, and all of which become animated when they make up part of a winning combination. The warriors, for example, start to wave their axes around and the ship sails about a bit, which adds a little movement to the proceedings. Play commences once it’s decided how much to stake on each spin, with a coin range of just 0.01 to 0.20 per coin, and up to 500 coins being accepted, with each value multiplied by 50x to give the total wager per spin. As there’s no conventional paylines, that’s all the players need to do before clicking to spin the reels and seeing what symbols line up for them. A couple of additional symbols mix things up a bit when they appear in the right places, both of which will be pretty familiar to pokie players. The wild takes the form of the Arctic Fortune logo, and works in a conventional way by replacing other symbols if it completes a winning combination by doing so. However it only appears on reels 2 and 4, and has no intrinsic value of its own, so unlike some games where the biggest payouts come from lines of the wild symbol, that’s not the case here. The other special symbol is the treasure map scatter, which is a bit more interesting as two of them landing at once treats players to a win that is equal to the total amount bet, while it can be literally scattered around the reels to pay out a prize, so it doesn’t need to be on a payline at all. But this is let down somewhat by the fact that more than two scatters at once won’t be worth a prize on their own, which seems a bit mean, but I guess it’s made up for in other ways. In common with many other pokies, the scatter is also the triggering symbol for a bonus round, and when 3 or more land at once, a free spins game will begin. A nice extra feature is that players first get to enter a scene set in a dark dungeon that’s arguably the highlight of the game. In this round, the numbers of free spins, a multiplier and bonus coins are awarded when players aim arrows at giant spiders that are covering a door. Quite what giant spiders are doing in a pokie themed around Vikings I don’t know, but it looks great and can lead to some decent features. Free spins are added up with each spider killed, red spiders are worth multiplier amounts when they get shot down, while an extra-big spider appears from behind the door, and killing this one off awards bonus coins. The free games then play out, with up to 40 free spins and a 6x multiplier in place throughout, although realistically, players would be pretty lucky to get this number. Victory for Vikings, or a Web of Deceit? Arctic Fortune has a couple of interesting features that make it somewhat different from the majority of Poker machines, notably the 1024 Ways To Win, that brings in frequent prize winning spins, and the potentially rich free spins game. It’s almost worth playing for the spider attack round, but the rest of it is quite entertaining as well. Although pokies set in cold environments can put some players off, this one is certainly worth a go at the online casinos that feature Microgaming titles.